Titan Moon Clearest View : NASA Scientists have provided clearest images of Saturn’s Icy Moon Titan using data provided by Cassini Spacecraft. You can now have a most seamless global view of Titan’s Surface! Scientists used 13 years of data gathered by Cassini spacecraft by it’s Visual and Infrared Mapping Spectrometer (VIMS). In previous pictures there were seams between different areas of surface, while these new images exactly represent Titan’s Surface as it might appear to a casual observer, if the observer sees behind the curtain of hazy atmosphere of Titan. You can not directly observe the Titan’s Surface because the Titan is enshrouded by thick Clouds, small particles called aerosols in Titan’s upper layer of atmosphere scatter visible light. 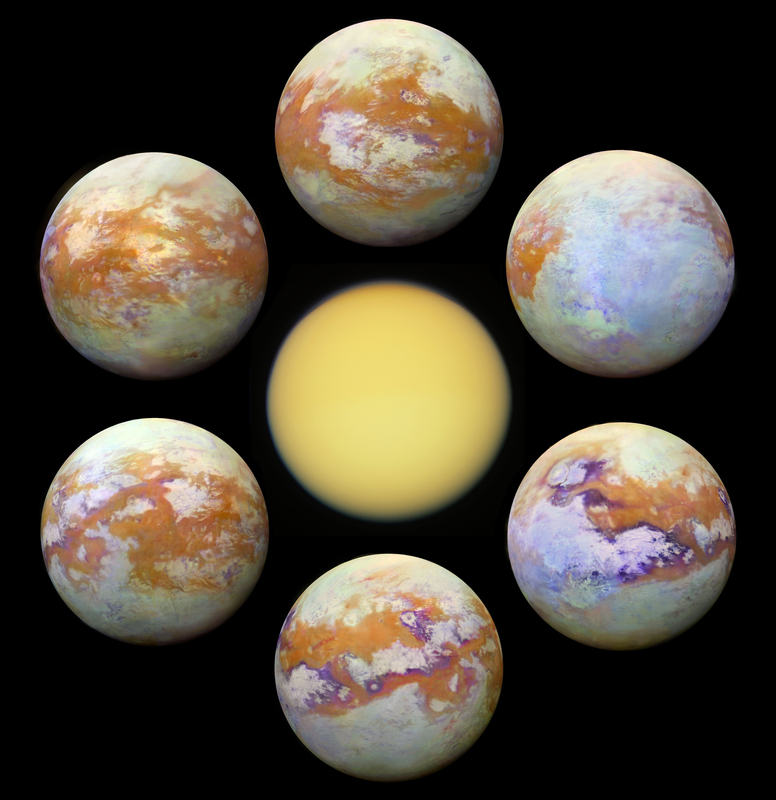 By only using infrared instruments you can see behind that thick cloud, that’s how Cassini’s VIMS instrument taken these photos of Titan’s Surface. These photos are result of laborious and detailed analyses of the data and tedious hand processing of the various photos provided by Cassini. These images of Titan Moon prove that Titan has a complex surface with many geologic features and compositional units. The Cassini spacecraft was launched in 1997, it arrived near Saturn in year 2004, since then Cassini were observing the planet and it’s moons, it sent more than 450000 photos back to earth and revolved 294 times around the giant planet. On Sep 15 2017 scientists sent Cassini spacecraft on a collision course with Saturn, They were fearing that Cassini might crash on one of Saturn’s moon which could host life. Thanks to Cassini, it provided usa valuable inside view of Titan. ← Clearest Photos of Centre of the Galaxy Milky Way by New Giant Radio Telescope.